← How to increase long- and short-term risk to the American economy. Earth Day 2017’s Campaign is Environmental & Climate Literacy. Education is the foundation for progress. We need to build a global citizenry fluent in the concepts of climate change and aware of its unprecedented threat to our planet. We need to empower everyone with the knowledge to inspire action in defense of [Emphasis added] environmental protection. 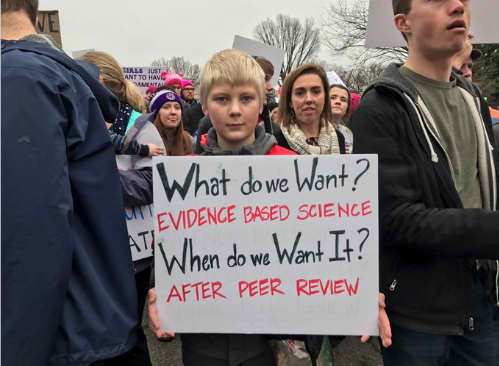 Meanwhile, we read: The March for Science is the first step of a global movement to defend [Emphasis added] the vital role science plays in our health, safety, economies, and governments…Science, scientists, and evidence-based policymaking are under attack. [Emphasis added] Budget cuts, censorship of researchers, disappearing datasets, and threats to dismantle government agencies harm us all, putting our health, food, air, water, climate, and jobs at risk. It is time for people who support science to take a public stand and be counted. This defensiveness might well be unnecessary – and even if justified or provoked in some sense, will likely hurt us. As scientists, we ought to be interested in the science of defensiveness. [Yes, that is a thing.] Here is a taste of what that science has to teach us [selected on a wholly unscientific basis – I’m providing excerpts from the first link I clicked on after googling the term, which comes from a Randy Conley blog, Leading with Trust. If you want, you can readily find peer-reviewed material to this effect.] that gives the flavor, provides food for thought. The connection to put-upon-scientists-and environmentalists-beset-by-politicians-and-the-world ought to be obvious, but I’ve injected commentary (the un-italicized text) just in case. People react defensively because they anticipate or perceive a threat in their environment, not usually because they’re just wanting to be difficult. Unfortunately, defensive behavior creates a reciprocal cycle. One party acts defensively, which causes the other party to respond defensively, which in turn causes the first party to raise their defenses even higher, and so on and so on. [Emphasis added. This escalation is the key risk for all of us.] Defensive behavior can be a complex and murky issue. For many people, their behavioral patterns stem from emotional, mental, or personality issues/tendencies developed over the course of their lifetimes (feelings of abandonment, inferiority, low self-esteem, narcissism, etc.). Somber? Defensive? Viewed in this light, whatever the provocation, however righteous the cause, those reactions are not helpful – either in our individual relationships or when it comes to the wholly artificially constructed and unnecessarily confrontational scientist-policymaker divide. Social science is clear on this. To March for Science or observe Earth Day in a defensive spirit serves only to harden positions and make much-needed reconciliation, trust, and collaboration more difficult. What’s the alternative? To frame and participate in both Earth Day and the March for Science in ways that can clearly (and only) be seen as celebratory. Seems like a big challenge. And there’s not much time to get in such a frame of mind! The next post will point to some motivation and means. [Spoiler alert] Easter is involved. Failed the IQ test for linking to the March for Science website here; but google March for Science, click on the first link, and you’ll reach the text cited. 8 Responses to Reflections on science, defensive behavior – and Easter. Thank you for this! I’ve been thinking the March for Science has been lacking key leadership in the context and framing of what the March is trying to accomplish. Like the Women’s March, there should be a strong positive message, not simply an “anti-” or defensive one. Science does not need to be defensive, after all, though emotionally it can be difficult these days not to come to its defense. I’m looking forward to your coming post! Thank you, Joanne… and Easter blessings to you and Marc. Most excellent, Bill! According to the Council on Environmental Quality, the environment has never been healthier. This should be cause for celebration. “Big Science” is under attack in the US because the average citizen no longer trusts the technocrats and zealots who presume they have the high ground in making the world a better place. People trust what science can do but doubt whether scientists are doing enough on the things that matter. The best defense of science is pointing out all the positives we’ve accomplished. Unless we do that, the March will be seen as just another thinly disguised attempt by greedy hogs to get more governmental slop in their troughs. What evidence do you use to theorize that dynamics in play at an individual level will play out in a similar way at the societal level? I’m not exactly defending the tone that you are speaking to, and such a tone may not significantly alter the current dynamics in play related to the interface of science and public policy, but I would argue that it is a bit of a stretch to suggest that this march will meaningfully create[s]” a climate of contention and tension that eventually leads to a loss of trust, alienation, and separation. “ Questions related to trust, alienation and separation have already been in play for a while now. Very thoughtful/important question. Boycotting buses, sitting at lunch counters, crossing the Pettis bridge and much more certainly weren’t celebratory. They were acts of individual and group courage in the face of real evil. Some questions for you: Was the civil rights movement a mere “defense” of freedom that African Americans already enjoyed? Or was it more a “demand” for freedom, equal rights, from individuals and groups that were denied that right simply because of their color? Weren’t those protestors in very real physical danger? Weren’t they in danger, and weren’t their futures horribly compromised by racism, whether they marched or not? Had they been able to find anything like real justice in the courts? Are the scientists and their friends who’ll be marching this Saturday in physical danger? Forced to segregate based on their identification as scientists? Denied public education, good health care and equal opportunity because they (we) are scientists? Underpaid for the work we do? For you, what are the similarities between African American’s plight — a struggle which still goes on today in all sorts of forms — versus the “plight” of scientists? What are the differences? As a scientist, how are you experiencing prejudice and threats to your work from society? Is there a risk that as scientists (and our friends) march on Saturday that some if not the majority of people watching the coverage later in the day on television will see us as better off than they and/or ask “what do they have to complain about?” Is there a risk the demonstration will come off as anti-Republican, or anti-Trump versus pro-science? Will this then turn science from something everyone supports into a a subject that alienates roughly half the population? If so, will that deepen the very problems we’re attempting to resolve? Challenges to scientific freedom and integrity, threatened and real cutbacks to environmental programs, and more may seem very tangible to some of us (they remain matters of real concern), but are likely to remain almost invisible to many viewers. But I wonder if you’ve read only this post in the blog, or whether you’ve taken the time to sample other posts, to get a truer sense of where thought process here. And I ask whether you might have googled expressions or phrases like “defensiveness among nations” or “defensiveness among groups?” To take steps like that is to uncover a vast sea of opinion and analysis (and some research, although social sciences are only marginally funded) from multiple perspectives. To wade in there is to get in a bit of a tangle. And I have a day job! Thanks again for reaching out amidst all the competing claims for your attention, and hoping to hear more from you and others. There is a flaw in your otherwise sage advice, Bill. For the zealot, emotion is not a means but an end. So those who might benefit from this guidance are more likely to take it as a threat than as an opportunity. It’s not that reasonableness merely does not interest them — it offends them.